I’m sure most of you are guilty of having a little love affair with cheese. I mean how could you not?! Thomas always laughs because sometimes I can’t help myself and I will nibble the corner end off of a block of parmesan like a mouse because I’m too lazy to cut it! He’ll open up the fridge and there will be two teeth marks in the cheese haha. What am I five years old?! One of my favorite date nights is to lay out a charcuterie cheese board and snack throughout the night, with a glass of red of course. I would perfectly content if that was my dinner most nights of the week! The essentials for me is always a soft mild cheese like brie, blue cheese because it’s my fave, and something sharper like an aged cheddar or gouda. 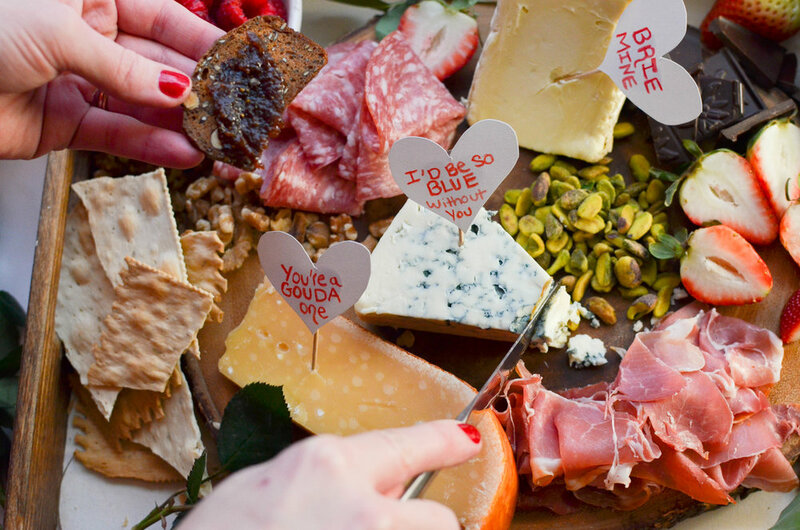 These cheese tags were so simple to make - Just cut out hearts of white card stock, use a red colored pencil or sharpie for the lettering, and tape on the back of toothpicks or any cheese tag you have! Easy peesy and adds a cute touch for a galentines party or date night! I bought everything from Trader Joe’s but you can get everything from your favorite grocery store! Have fun with this and add any other nibbles that you think would be festive!